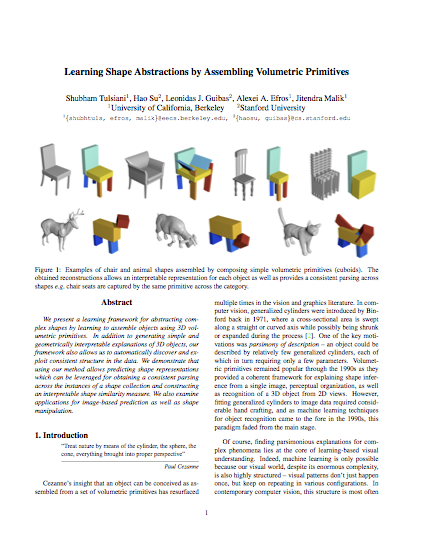 Examples of chair and animal shapes assembled by composing simple volumetric primitives (cuboids). The obtained reconstructions allow an interpretable representation for each object as well as provides a consistent parsing across shapes e.g. chair seats are captured by the same primitive across the category. We present a learning framework for abstracting complex shapes by learning to assemble objects using 3D volumetric primitives. In addition to generating simple and geometrically interpretable explanations of 3D objects, our framework also allows us to automatically discover and exploit consistent structure in the data. 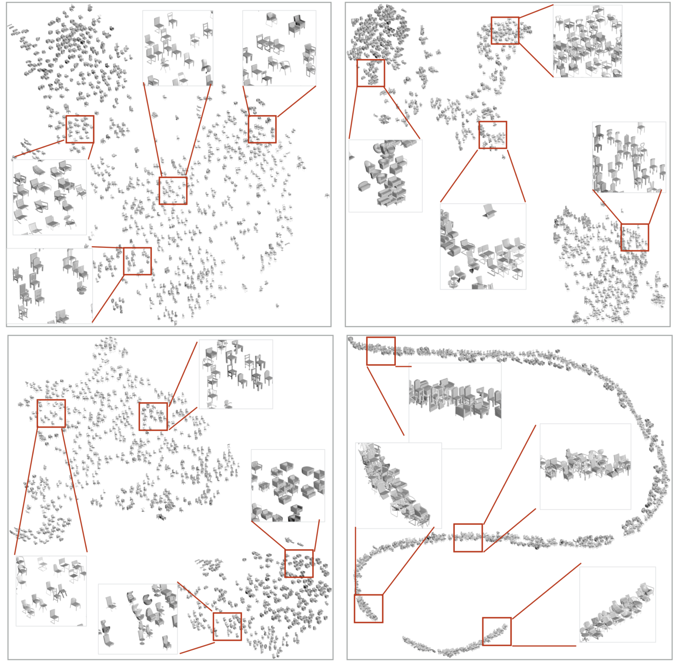 We demonstrate that using our method allows predicting shape representations which can be leveraged for obtaining a consistent parsing across the instances of a shape collection and constructing an interpretable shape similarity measure. We also examine applications for image-based prediction as well as shape manipulation. Tulsiani, Su, Guibas, Efros, Malik. Our framework allows us to automatically discover descriptive, consistent and interpretable shape abstractions using a collection of 3D models and enables several applications. Unsupervised parsing obtained by assigning each mesh point to the closest primitive. We see that similar parts e.g. aeroplane wings, chair seat, etc. are consistently parsed. Embeddings obtained using various similarity measures - a) Voxel IoU b) Ours (all primitives) c) Ours (seat and back primitives) d) Ours (back primitive orientation). Deformation of the source mesh (top) to have a shape similar to the target mesh (bottom) by using the inferred primitive representation. We thank Saurabh Gupta and David Fouhey for insightful discussions. This work was supported in part by Intel/NSF Visual and Experiential Computing award IIS-1539099, NSF Award IIS-1212798, and the Berkeley Fellowship to ST. We gratefully acknowledge NVIDIA corporation for the donation of Tesla GPUs used for this research. This webpage template was borrowed from some colorful folks.